New car prices can change over the course of the year. Buying a new car can be a daunting process, both financially and emotionally. Getting the best deal possible is every new car buyer's goal, but knowing just how to do so isn't easy. The time you choose to buy may impact how much you pay, with certain times offering more savings under the right conditions. 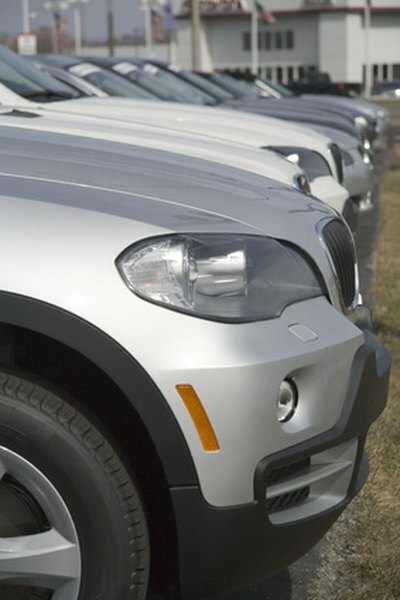 Automakers frequently offer incentives to dealers and customers. These incentives take the form of discounts, low interest rates for new car financing and special warranty or service packages. You can save money by buying a new car during one of these incentive periods, which last between several days and a month or more. Knowing which type of car you want to buy allows you to move quickly once an incentive is announced in a dealer's advertising. Automakers change the styling and available features of their cars on a regular basis. Redesigned models receive considerable fanfare and generate interest. They also drive down the cost of new cars from the most recent model year. While these cars don't include the newest features or designs (the updated models may not even be available for sale yet), they are often among the best values in new cars, especially if dealers have high levels of stock. Check automaker websites for news about redesigned models and visit your local dealership when you know that new models are on the horizon, causing other would-be buyers to wait to make their purchases. One of the commonly cited times to buy a new car is in the days just before the end of the month. This holds true when auto dealers use quota systems to reward sales staff with bonuses or rank their performance based on monthly sales numbers. However, if demand spikes because many buyers believe that the end of the month is the best time to buy, sales staff may be able to sell just as many cars without offering any price reductions at all. If you've done your research, and a salesperson offers you a price that you think represents a bargain, you shouldn't let the timing keep you from making a deal on a new car. While some buyers believe that the end of the day is the best time to buy a car, when sales staff are in a rush before shutting down for the night, some dealerships actually offer bonuses to sales staff that make the first sales of the day, creating a time-based incentive that buyers don't know about. Likewise, unusually high demand for a particular model or color may prevent you from getting a better price, regardless of when you visit a dealership. AOL Autos: Why Buy a Car at the End of the Month?